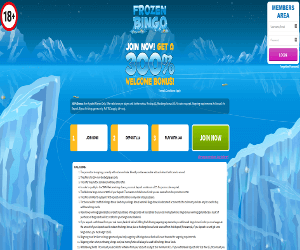 Frozen Bingo is a new bingo site operating on the Cassava Enterprises label that has an Arctic and frosty theme. There is an icy blue background with adorable bingo ball shaped penguins and cute snowmen. Choose from a great selection of bingo games including 75-ball, 90-ball and 5 line Bingo along with online slots, scratch cards, and table games. Frozen Bingo also offers amazing bonuses and promotions for the coolest online bingo experience! The Welcome Bonus is a 300% match bonus offering up to a cool £60 free with a first deposit. Frozen Bingo has an exciting variety of online bingo games. Players can have a blast playing 90-ball, 75-ball, and 5 line bingo games to their hearts content. There are also several free bingo rooms offering real cash jackpots! The Ice Breaker room is a special free bingo room for first time depositors and the Re-freeze room can be accessed with each redeposit. There are also loads of progressive jackpot bingo games such as Lucky 90, Highrise, Diamond, 5 Line, and Cosmopolitan! In addition to all the amazing bingo, players can choose from top online slots, Scratch Cards, table games, and more! All the top gaming titles are available to play such as Cleopatra, Sugar Train, and Fluffy Favourites slots. Plus, there are mini side games to play while playing bingo for extra winning opportunities.